Doraemon and friends run away from their home and travel back in time to the 70,000 years ago where nobody existed to build their ideal private paradise. After they fully relished the freedom in the era, Doraemon and friends bid farewell to their paradise and come back to the present day. However, a few days after they came back home, Doraemon and friends bump into a caveman called "Kukul" in the current era. They find out that the caveman Kukul was accidentally transported forward to the present, and that his tribe called Hikari tribe was attacked and abducted by Giga Zombie and Kurayami tribe after Doraemon and friends left the primitive age. 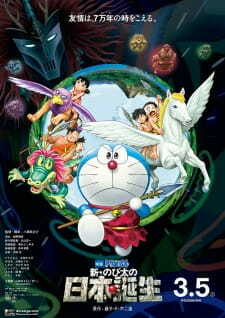 Shin Nobita no Nippon Tanjou is a remake of the 1989 Doraemon film Nobita no Nippon Tanjou.